Marvell has introduced the world's first 1.5 GHz tri-core application processor, the Marvell ARMADA 628. This product incorporates a full System-on-a-Chip design (SoC) with three high performance Marvell-designed, ARM-compliant CPU cores operating as the world's first commercially available heterogeneous, multi-core, applications processor. The new ARMADA 628 tri-core processor incorporates a number of advanced processing and power management features. The tri-core design integrates two high performance symmetric multiprocessing cores and a third core optimized for ultra low-power. The third core is designed to support routine user tasks and acts as a system management processor to monitor and dynamically scale power and performance. The tri-core architecture provides superior performance and lower power over dual-core designs while maintaining industry compatibility and leadership — ensuring a richer, faster and smoother experience than any other ARM-based processor available today. The architecture is analogous to a hybrid muscle car. The ARMADA 628 is intended to perform like a race car engine on demand, while still delivering the frugal gas-mileage of a hybrid automobile. In real world terms, this enables the ARMADA 628 to play more than 10 hours of full 1080p HD video or 140 hours of music on a single charge while still providing 3 GHz of raw computational horsepower. 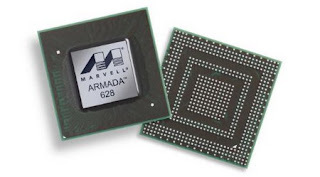 Marvell's ARMADA 628 tri-core CPU comprises a complete SoC design – a first for the industry. In addition to the tri-core CPU, there are six additional processing engines to support stunning 3D graphics, 1080p video encode/decode, ultra high fidelity audio, advanced cryptography, and digital photo data processing – for a total of nine dedicated core functions. The ARMADA 628 is also designed to be the first mobile CPU to provide high-speed USB 3.0 connectivity, which offers 10x faster performance than USB 2.0. The ARMADA 628 is based on a Marvell-designed ARM v7 MP compatible CPU offering 1.5 GHz performance. It offers support to use LP-DDR2 or DDR3 memory up to 533 MHz, a highly flexible display controller capable of driving four simultaneous displays at up t o 2K x 2K resolution, and a highly robust security subsystem that includes a secure execution processor. An integrated 3D engine renders 200 million triangles per second for an immersive game play experience and a multi-format video engine supports dual stream 1080p video for a true 3D visual experience. In addition, the ARMADA 628 supports DirectX, Open GL ES 2.0, and Open VG 1.1 – ensuring complete compatibility with the most hotly anticipated mobile game titles. ARMADA 628 supports RIM OS, Android, Linux, Windows Mobile, and full Adobe Flash. o "Heterogeneous multiprocessing" with "hardware-based Cache Coherence"
The ARMADA 628 is currently available for sampling to customers. For more information please go to www.marvell.com. 0 comments on "Marvell ARMADA 628 is the world's first 1.5 GHz tri-core application processor"